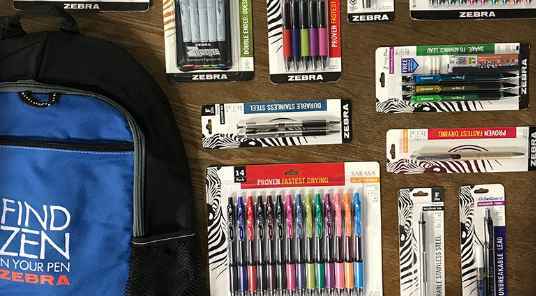 Zebra Pen brings you the Zebra Pen Find Zen During Back to School Sweepstakes where they will be giving away a Zebra backpack filled with Back to School supplies with an Retail Value of one hundred twenty-five dollars $125.00 to one lucky winner every week. How To Enter: Go to this link:www.Zebrapen.com/schoolsweepstakes and follow the online instructions to register by entering all information requested on the registration form and once you filled out the entry form now Click on the submit button to complete the registration form. Prizes: 9 lucky prize winner will receive a Zebra backpack filled with Back to School supplies with an Retail Value of one hundred twenty-five dollars ($125.00) each. Who Can Enter: The Zebra Pen Sweepstakes is open only to legal residents of the fifty (50) United States and District of Columbia who are thirteen (13) years of age or older at the time they enter the sweepstakes. When To Enter: The Sweepstakes entry begins at 9:00:00 am Eastern Time (“ET”) on July 1, 2018 and ends at 4:00:00 pm ET on August 31, 2018. Who’s Sponsor: The Zebra Pen Find Zen During Back to School Sweepstakes is sponsored by Zebra Pen.